I had a delightful consulation with Val Heart. After completing a long journey through the Mayo Clinic Health System,, I felt like I had been hit by a tsunami. My life look like a debris field. As a former executive director, I could not fathom what had happened. Slowly, I began to reaize this “dark night of my soul” was a magnificent spiritua awaking. As my Authentic Self came forth, a clear vision was bestowed upon me. I surrendered to the infinite possibilities of this vision’s unfolding. Val completely understood my journey that led to our conversation. 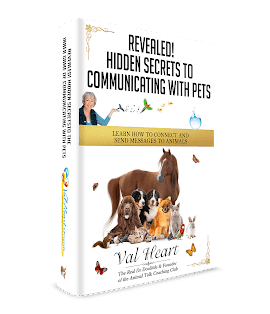 As a pioneer in the field of animal communication, her journey has not been a linear path either, Her experience have served to teach her incredibly valuable lessons. During our conversation, this wisdom was evident and solidified her capacity to serve as a business mentor and coach – a very wise investment!